Kevin's friends, family, and associates look forward each year to his holiday card depicting a winter urban or suburban scene in the Capital District. Learn how he goes about creating this images, usually sitting in his car, through a process of rough sketches, value and color studies, and finished watercolors. We'll cover the logistics of drawing and painting in your car, looking out of a window in your house or a cafe, or working completely outdoors during the winter months, including choosing and carrying supplies, setting up comfortably, etc. We'll also discuss design, composing, perspective, drawing basics and different media conducive to sketching on the go. 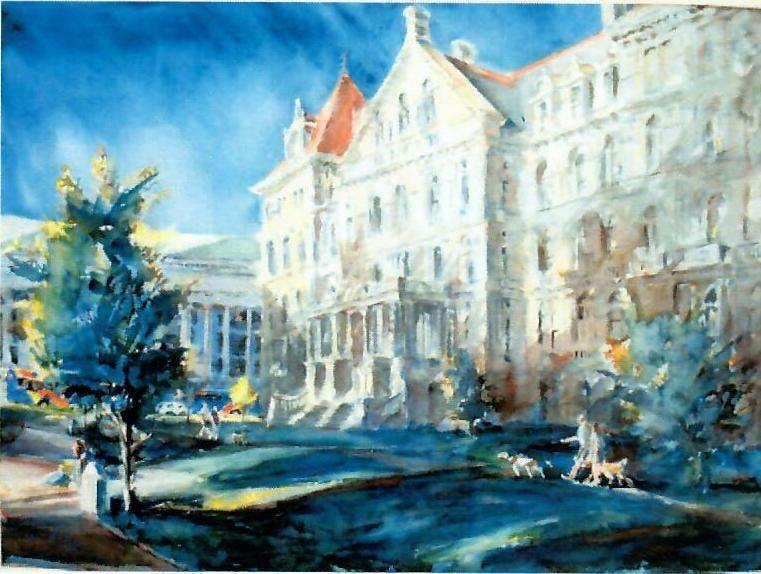 You might have seen Kuhne's work before -- he's painted many local scenes, and some of his watercolors were on display at the First Presbyterian Church of Albany this past spring. The class at Arlene's on Fuller Road is this Saturday, December 1 from 11 am to 4 pm. The class fee is $60. By the way: Arlene's frequently has all sorts of art classes, from block printing to paper wreath making to oil painting to color theory. Kevin is a great art teacher - for beginners and more advanced students. He's informative, down to earth in his approach, and very entertaining. Oh, come now: "This sounds like it could be relaxing"! Drawing is difficult and engaging, making one think. A lot. It is often frustrating. It is not relaxing!